APPSC Group 3 Hall Tickets Download 2017: Candidates can download the APPSC Panchayat Secretary Hall ticket 2017 at psc.ap.gov.in, manabadi. APPSC Applications are invited On-line for recruitment to the post of Panchayat Secretary (Grade – IV) in A.P. Panchayat Raj Subordinate Service. Andhra Pradesh Public Service Commission (APPSC) is going to conduct Group 3 exam for AP Panchayat Secretary posts. It has scheduled the screening test to be held on 23rd April, 2017. The exam will be organized in diverse exam centers of the state for which students will appear in great numbers. Now all the aspirants who have applied for the exam have been waiting for the release of hall tickets. 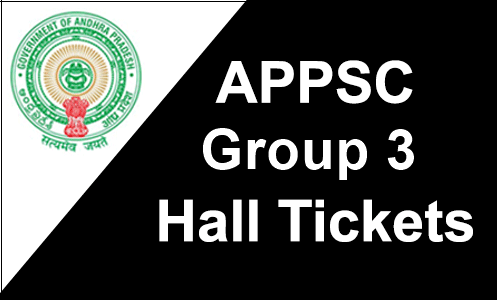 The APPSC Group 3 hall ticket is a mandatory document every student should carry to the exam hall without fail. APPSC Hall Tickets for SCREENING TEST to the post of Panchayat Secretary Download from below links. The Hall tickets/ admit cards are available in the official website of APPSC for download i.e., www.psc.ap.gov.in. Aspirants who have applied for the APPSC Group 3 exam are advised to download the hall tickets by visiting the official website of the board 7 days before commencement of Examination. The main examination in On-Line mode for candidates selected in screening test will be held through computer based test on 16/07/2017 FN & AN. Syllabus: The syllabus for APPSC Group 3 screening test 2017 is available for download in PDF format in the official website of APPSC. As there will be heavy competition for the post candidates are advised to download the syllabus and start preparing effectively for the screening test. Candidates are also suggested to take mock tests to estimate their performance. The syllabus includes Science, History, Health care, basics of biology, physics, geography, Indian culture, industries, minerals, child development, women welfare etc. Exam pattern: APPSC follows certain pre-defined exam pattern while conducting the screening test. In order to crack the exam, candidates should be well aware of the exam pattern first. The screening test is held for 150 marks. There will be 150 questions in the paper and each question carries one mark. There is a negative marking of 1/3 for every wrong answer. APPSC is going to recruit candidates for Group 3 Panchayat Secretary posts. There are about 1055 vacancies in the post and APPSC is going to fill in all the vacancies with this recruitment. Applications have flowed in for the post and now all the applicants have been waiting for hall ticket release. APPSC has announced that admit card is available for download in the official website of the board and manabadi, schools9 websites also. Aspirants can download their respective hall tickets starting from 14th April 2017. The Hall ticket / admit card contains important details like name of the applicant, applicant photo, date of birth, exam name, exam venue, exam timing etc. So make sure to download the AP Group 3 hall ticket on time and also carry it to the exam hall without fail. How to download APPSC Group 3 Screening Test Hall Tickets 2017 online? Visit the official website of APPSC i.e., psc.ap.gov.in. The link will take you to a new page where you can find the link saying APPSC Group 3 hall ticket 2017. Click on the link and enter your application number and password. Take a printout of it and make sure to carry it to the exam hall.